To be honest it is very hard to try to keep up with my current listings in my Etsy shop. I now have close to 350 items listed and more items are listed and sell daily. I’ve been trying to take more photos showing myself wearing some of the pieces before they are shipped off so I thought I’d share some of the lovelies with you before they disappear. I just love the shape of this dress! So Agent 99. 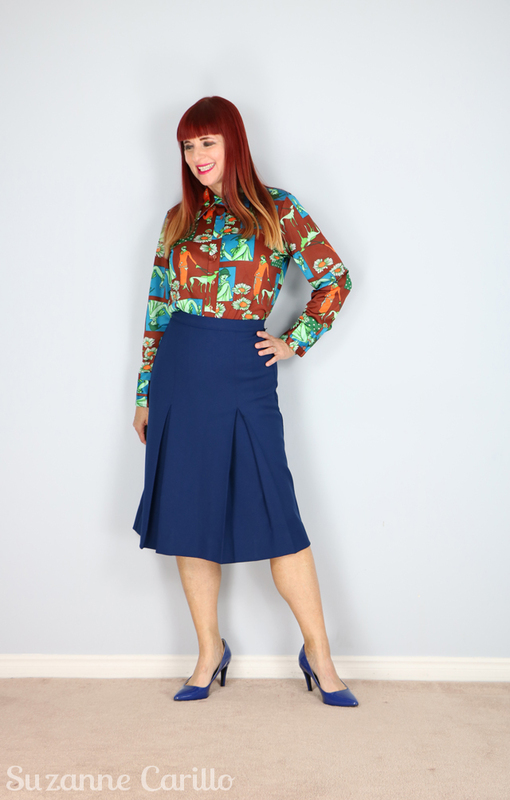 The novelty print blouse I’m wearing here will be listed as soon as I get a button sewn on the cuff. How do you like the added pom-poms I sewed onto this fun dress? I wore this dress when I was in Hong Kong last year. This is one of the very rare cheongsam dresses that is actually very comfortable to wear. It looks like a shift when it isn’t belted. 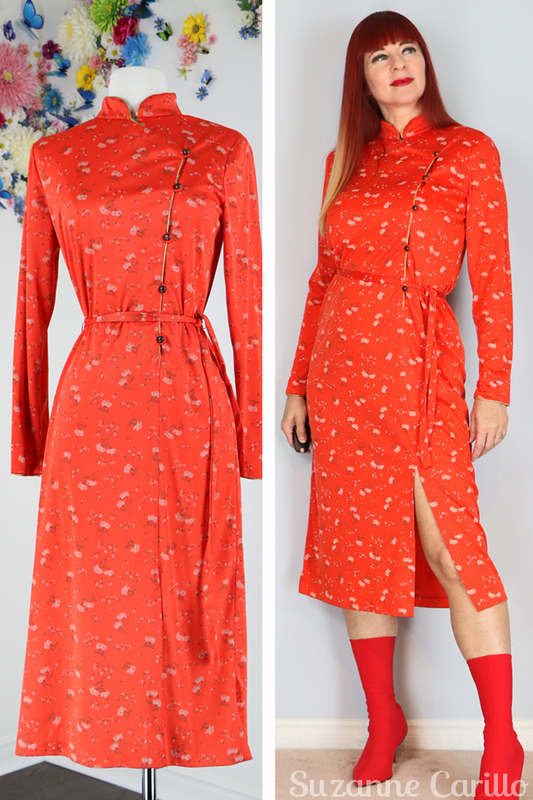 This is another dress that looks brilliant with those red boots : ) The top of this maxi dress is made out of a groovy crochet knit. 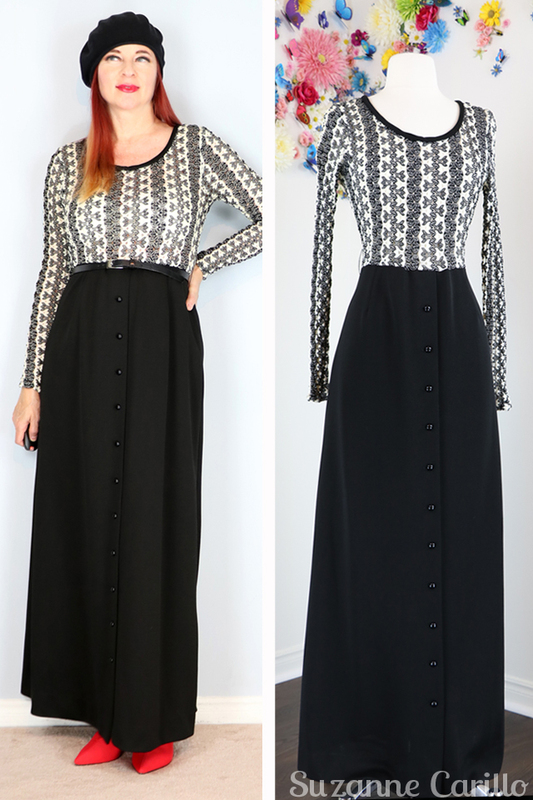 The detail I like most on this maxi dress is the peek-a-boo sleeves. Vintage pieces often have the most unexpected design elements. This dress is as light as air. It is so rare to find cotton like that now. 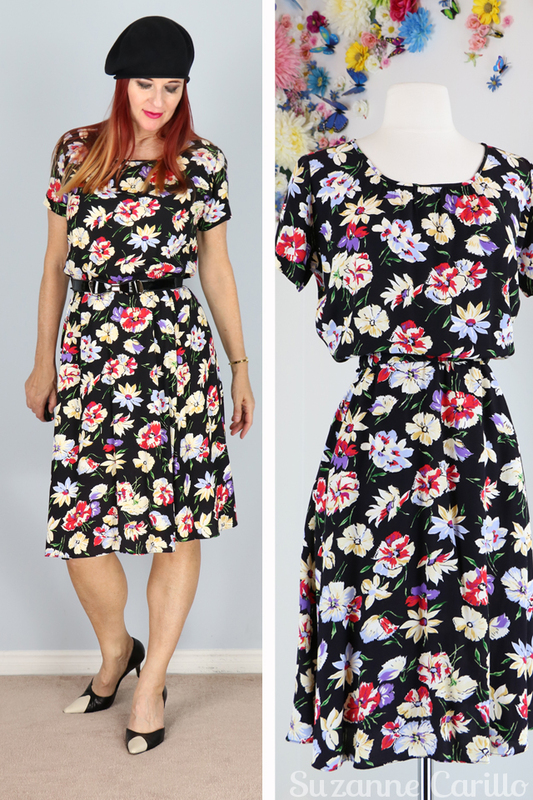 The rayon fabric this floral dress is made out of it is wonderful, light, silky and washable. The camera doesn’t do the best job of picking up all the random sequins on this fun knit dress. Like I wrote sometimes these vintage pieces move quickly. 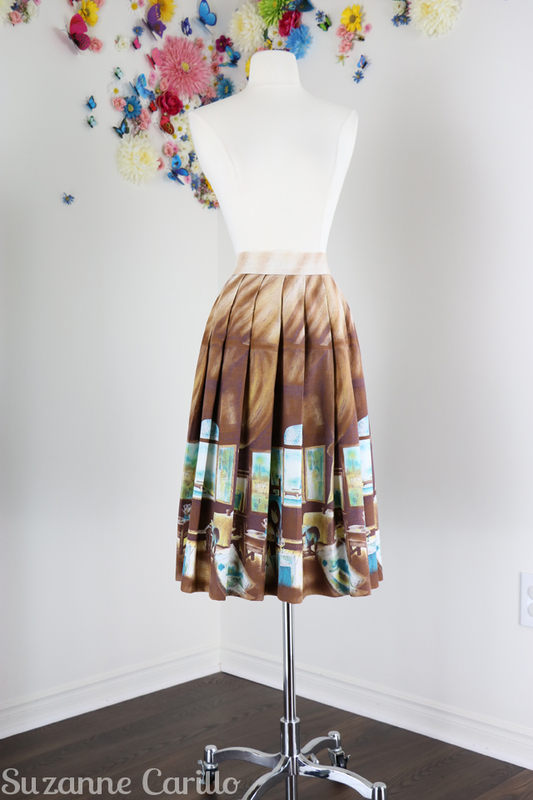 This amazing novelty print 1950s handmade skirt with an image of an artist’s studio in Paris on it sold within five minutes of being listed. I didn’t even have time to get photos of myself wearing it! The fabric was stamped from Paris as well. I get so excited when I find such unique pieces like this while thrifting! Novelty print skirts are in very high demand and sell for big bucks. 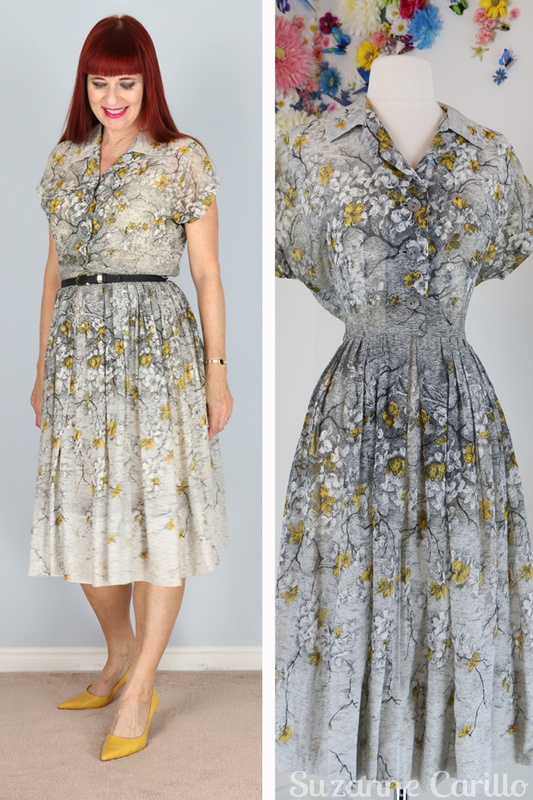 That day I also scored a pristine 1930-40s dress. I’m having the zipper replaced now but it is stunning! Shame I’d have to lose four ribs to fit into it. I’m crossing my fingers it’ll fit on my mannequin. That first dress is so mod and groovy with my red boots. That is probably the one I’m thinking I *may* keep. We’ll see. That means another dress has to leave my closet as there is simply “no more room at the Inn” if you know what I mean. If you want to keep up with my newest listings on my Etsy store be sure to favourite my shop. Now…I have another hundred or more (probably more) items to photograph and list so I’d best get busy! Some fantastic pieces Suzanne. Love the burgundy dress! My Ribhkoff dress is beautiful and I look forward to wearing it at a special occasion I have in mind! I’m so delighted to know that the Ribkoff dress worked out for you! The first one is my favourite too! I LOVE it! 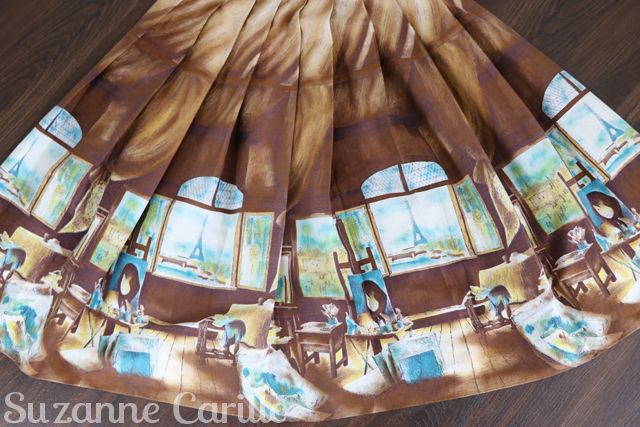 Thanks for showing us a pic of the Paris Skirt! I could really see you making a dress similar to that first one. The details are wonderful. You found great pieces. The first 1960 blue dress and the 1980 floral dress down to the end are pieces I wouldn’t sell if I were you. Too good. Well if you only knew just how many clothes I already own you might not be saying that! Ha! Lovely things! That first dress looks particularly fab on you. I really wish we had more festivals here and I also wish I had someone to do the shows with. With husband in Hong Kong it’s not easy. Alone it is simply too much for me. I’m going to be going to the annual vintage clothing show this weekend with Shelley. That is the show I did with my husband before. I would have loved to have been exhibiting at it. Hmmm. Hard to chose which is my fav. 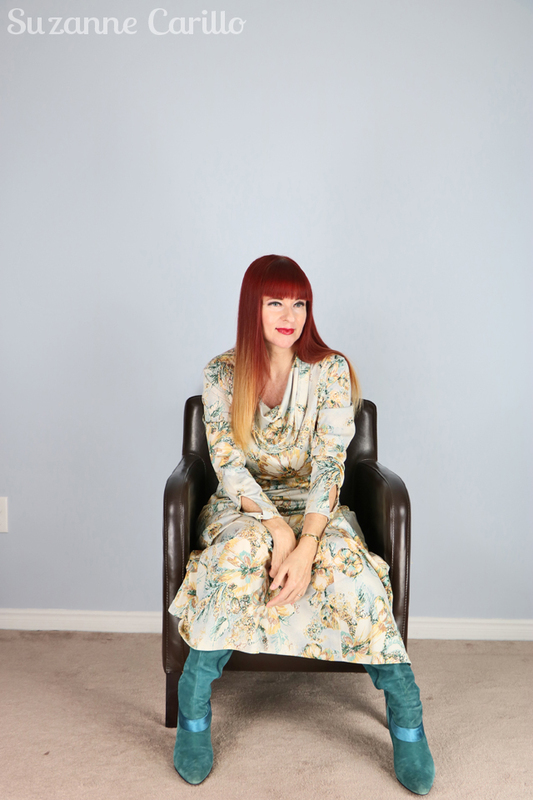 I do love the 60s mod shift, the cowl neck maxi , the velvet and the 50s floral. I am not surprised at all that the Paris skirt went right away. There is a always a demand for vintage novelty prints. I will check out the store! So many great pieces! Also my fav is the skirt that sold. Also love the knitted sequin dress! You have such a great eye for finding such treasures, Suzanne!! I’m so impressed at your willpower to sell them. I might have trouble and want to keep all of them!! And my closet is bursting too!! Wow wow wow! They are almost to beautiful to wear! Well done photographing the items before shipping them, and they all look fabulous on you! My absolute favorite is the Mexican fiesta dress, the burgundy velvet dress and the Chinese dress! The first one is fantaaaastic, I loved it so much! As you know, S is not my size, I wish it were just to be able to buy and wear these amazing items! Bisous! I love how you added the pom-poms. And thanks for showing that Paris dress. It’s great that you have merchandise moving so quickly. My favourite here is the Agent 99 dress, which you named so well! It looks dynamite on you! And the Ribkoff. I have to say, it’s weird that these are already vintage – it seems like only yesterday I was experincing this stuff the first time around. 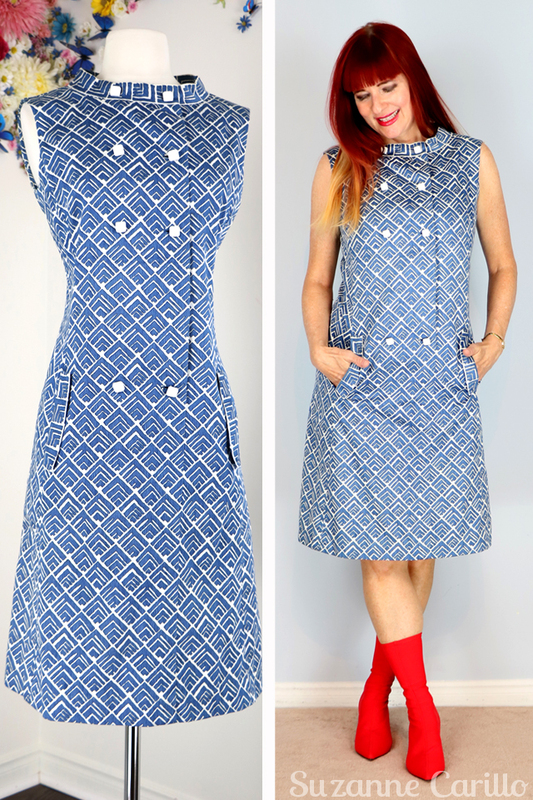 The little blue geometric print shift is a winner and looks really cute on you. Since I graduated from high school in 19t9 I can say from experience that this was a very popular silhouette of that time period. It looks really vute with the red boots. Funny how it is immediately modernized but remains so uniquely vintage. You do a fantastic job of digging up the best stuff Suzanne! You have a real eye for beautiful clothing regardless of the era. Hoping you have a visit with Robert coming up. I’ll bet he can feel a little closer to you when he reads your posts eh? The blue and white one is my favourite – definitely something I would wear if it was large enough. Unfortunately most of the items in your shop are sized S/M and I need a M/L, or just a L, in order to fit around my waist. This is why I don’t wear much vintage anymore except for jackets and coats. So many pretty pieces…you have a great eye for finding treasures. 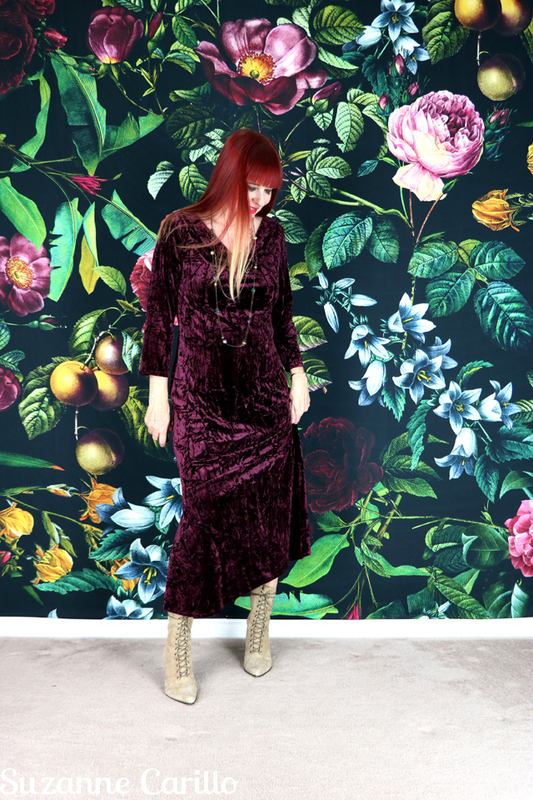 The velvet dress reminds me a lot of the burgundy velvet maxi I picked up from your shop last year. I’m considering wearing it to a wedding this weekend although I fear it still might be too warm outside.